In the current era of mobile phones, it seems as though everyone is moving towards larger screens and bigger forms. Even Apple has followed the trend, as the new iPhone screens are larger than ever. But in the Phablet Age, does bigger really mean better? Does this extra real estate really make a difference? The Virgin Mobile HTC Desire 816 4G LTE bets that it will. With a whopping 5.5 inch HD display, the front of the phone is put to good use. Even though its pixel count may not be an astoundingly huge number, it’s not that much of a problem, because the display looks wonderful. The colors are vibrant, the blacks deep, and everything pops in a really good way. The phone itself looks gorgeous, which is really good news, as some phablets have a tendency to just look like regular phones but engorged, with odd dimensions. Fortunately, HTC has put some thought into the way this phone looks and feels in your hand. Of course, the larger screen inherently makes one-handed use a bit difficult, which is irritating. For those of us with smaller hands, both appendages are needed to properly type. That said, if you turn on traceable keyboards, such as Swype, this becomes much less of a problem. One thing that HTC does for their phones that I find really neat is the front-facing speakers. Having termed it “Boomsound,” HTC gives their phones high-quality amplifiers and put the speakers on the front of the phone. On smaller devices, it sounds really nice, and on the Desire, videos and music sound astounding. The larger form gives more room for the speakers to shine and reverberate, and the improved internal amplifiers make even the lowest-quality headphones sound half decent. It’s almost worth picking up any HTC device for Boomsound alone. Performance-wise, the Desire is snappy. With the help of a 1.6 GHz Snapdragon processor and 1.5 GB of RAM, it’s fast and can handle pretty much anything you need to throw at it. HTC has been really pushing the cameras on this device, and they don’t disappoint. The app itself offers an experience akin to Apple’s camera app. Pictures that have just been taken don’t clutter up the screen. The photos themselves are pretty high-quality, and the app is nice to use. It runs Android 4.4.2 KitKat, with an overlaying HTC Sense 6.0 skin. Though most Android skins have become unnecessary thanks to Google finally beginning to focus on UI, Sense is still useful and good-looking. Some skins (cough cough TouchWiz) just kind of exist so the manufacturer can say they contributed something software-wise to their devices, but not Sense. Thanks to a clean look and features like Blinkfeed (more on that later), Sense really seems to add a layer of functionality. It also helps integrate the phone’s exterior design with what you see on the screen. Blinkfeed is a nice part of this experience, because it aggregates news, Google Now, and social media into one nice feed. A lot of UIs try to do this, but few can pull it off. Blinkfeed is moderately successful, as it’s not quite as efficient as BlackBerry 10 or Windows Phone 8’s Live Tiles, but better integration with the OS places it a few rungs above apps like Flipboard. Not to be outdone in the prestige phone arena, Virgin Mobile recently introduced the Samsung Galaxy S5 4G LTE, so if you want the latest and greatest from Samsung, hitching yourself to a contract doesn't have to be a Faustian bargain. In our review of the Samsung S3, we found the S3 a superb phone, and the S5 improves upon its predecessor in every way. The large screen is beautiful, the camera is capable of far better low-light performance, and the battery life is commendable, especially for such a large screen. The improved processor and update to Android offers a snappy, quick level of performance. Sporting a USB 3 interface, the charge times are reduced. With its 5.1" HD display, 16MP camera it is capable of performing at the highest level, and with its built-in S Health™ and heart rate monitor, you can place your finger on the back of the phone and get your heartbeat! If you are afraid that fear of contracts limits you to yesterday's phones, never fear, Virgin Mobile is here with the Samsung S5 4G LTE. Highly Recommended. The HTC Desire is a step above many other Phablets on the market today. Its specs are impressive, but more importantly, it is a joy to use. 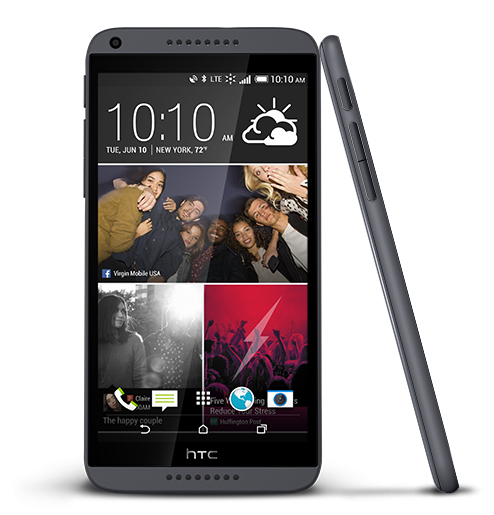 The Virgin Mobile HTC Desire 816 4G LTE comes highly recommended!